How do I find a California Closets location? Will California Closets deliver to my home? Yes, our expert installation technicians will deliver your custom system to your home and install it for you. Where are your closets made? All of our closets are manufactured locally or regionally. Due to the custom nature of our products, we do not offer returns. However, if you are unsatisfied with your system in any way, we encourage you to contact Customer Service so we can remedy the situation. What is the maximum height for a closet solution? The maximum height for a closet using a continuous partition is 2.75 m; however, we have many stacking methods and design options that will allow a system to go much higher. Please talk to your design consultant for further details and suggestions. What is the maximum length for a continuous shelf or closet rod? The maximum pole length is 92 cm, and the maximum length for a continuous shelf is 102 cm. Your design consultant can recommend the best design to accommodate any space, no matter how wide, by combining our products to optimize your space. What does "undermount slides" mean? Undermount slides refers to the hardware mounted to the bottom side of a drawer. These slides allow drawers to open and close smoothly and are able to hold more weight and provide more support than side mount drawer slides. Undermount slides are also often an aesthetic preference, as the metal slide components are not visible like they are with side mount slides. Drawers with soft close technology don’t slam shut — they close automatically with a gentle push. What does "dovetailed drawer boxes" mean? Dovetailed drawer boxes are drawers that are made with dovetail joints. Dovetail joints are located at each corner of the drawer, and they interlock like puzzle pieces to create a strong, durable connection that doesn’t require mechanical fasteners. You will need to clear any belongings out of your space. See our guide on How to Prepare for an Installation for detailed information on this process. What are your closets made of? 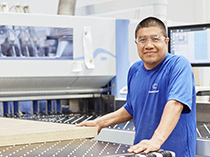 All of California Closets’ boards are made with laminated composite, which is made with recycled wood fibers. All of our finishes are CARB compliant, meaning they meet particular regulations for emission standards and are safe for the environment. Our board offers a number of benefits, making it more desirable than wood, including the following: It’s made from recycled wood fibers, which helps reduce content from the waste stream. It allows us to not use raw resources, as with solid wood. Because it’s made from recycled wood fiber, it complies with LEED® credit for recycled content. Because it’s laminated, we can offer a variety of finishes and textures that are not available with solid wood. We offer three finish collections: Classic flat finishes, such as white or ivory; our exclusive Italian-inspired Lago textured wood grains; and Tesoro textured finishes, exclusively imported from Italy. The available colors of these specific finishes will vary by location. Learn more about the variety of colors and finishes we offer. Installation is included in the cost of your system. How many drawer styles are available? 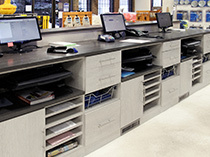 Many of the drawer styles we offer are similar to our door styles. We can suit a range of styles from traditional and transitional to modern and contemporary, thanks to the variety of materials and finishes we offer. Find more information on our door and drawer styles here. How do I care for my closet storage system? For routine cleaning, a mild, non-oily cleanser will remove dust and smudges, and a low-abrasive cleaner can remove more stubborn marks. For more detailed information on how to clean specific finishes and accessories, please refer to our guide on How to Clean Your California Closets System. Do your systems mount to the wall or sit on the floor? 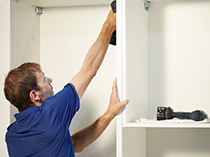 Every California Closets system mounts to the wall to ensure that itﾒs safely installed. Some designs are meant to be "off the floor, " while others are designed with toe kicks and top crown molding to look like an installed piece of furniture. 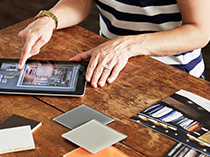 Your design consultant will walk through these options with you when designing your system. Yes, our products come with a limited lifetime warranty. Click here to view the details of our warranty. Do you sell parts to do it yourself? No, our systems are not sold as parts for do-it-yourself installations. Do I need to remove carpet or tile before you can install? You do not need to remove carpet or tile before you can install your system unless you are planning on changing the flooring around the area where your system will be installed. Yes, all original materials should be removed from the space where your new system will be installed. Can you supply doors for my closet? We offer a variety of sliding door options; however, we do not supply bifold or interior closet doors. Click here to view our sliding door options. Can you remove my existing closet or cabinets? No, the space where your new system will live will need to be free of existing cabinets, shelves and personal items prior to installation. Can I take my storage system with me when I move? It is possible to take your storage system with you when you move; however, it’s unlikely that the system will fit as seamlessly into your new home as it did in your previous home because of its custom nature. You can work with the California Closets where you originally purchased the system to get further details on the process of uninstalling and reinstalling your system. Alternatively, you can contact California Closets for your new house, and we will be happy to design the perfect closet for your new space. Many of our clients come to us throughout the courses of their lives and have us install California Closets in all the homes they live in. Once you experience life with a California Closet, you will not want to live without one! Can I purchase lighting or accessories separately? If you’re looking to enhance an existing California Closets system with particular accessories, our design consultants can work with you to add the desired options to your system. However, we are not able to sell lighting separately, and we are not able to add lighting to a preexisting system. Can I install my closet myself or hire my own installer? No, our installation technicians are trained in our systems and processes and will install the system. Can I get lighting for my closet space? Yes, lighting can dramatically improve the look and functionality of a space. A few of the efficient LED lights that we offer include puck lights, lit closet poles and illuminated shelves. With a variety of finish options and proven applications, we can easily brighten traditionally dark spaces. Why should I buy custom storage solution from California Closets? At California Closets, we pride ourselves on the ability to create custom home storage that perfectly fits your needs. 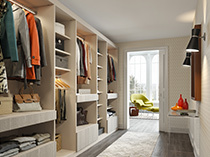 Made with high-quality materials in a variety of finishes, California Closets’ systems can be seamlessly incorporated into any space in your home. There is no showroom where I live. Can I still purchase a system and meet with a design consultant? Yes, a local design consultant is happy to come to you for a complimentary, in-home consultation. The design consultant will help you design the perfect storage solution to meet your needs and budget. What is the process of getting a custom storage system from California Closets? 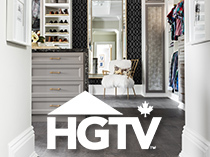 First, you will meet with a design consultant in your home for a complimentary consultation, during which he or she will listen to your needs, look at the space(s) where you’d like to install a California Closets system and take measurements. If you would like to start the design process with a consultation in your nearest California Closets showroom, that can also be arranged. The design consultant will collaborate with you to create a custom design that meets your needs, style and budget. Then, he or she will design your system using our proprietary computer-aided design (CAD) software and create a detailed 3-D rendering to give you an idea of what your new space will look like. Depending on the complexity of the design(s), this can be done during your initial meeting or in a follow-up appointment. On installation day, one of our seasoned installers will install your new system in your home. During installation, the installer will take utmost care of your space and your home, treating it as his or her own. After your new system is installed, the installation technician will show you how to adjust any components that are adjustable, instruct you how to properly clean your system and give you information on our limited lifetime warranty. To learn more about our design process, click here. The length of the process varies depending on the complexity of your design and the unique products that you choose. Typically, a design consultation takes 90 minutes. The design for your space is then finalized, and the system is then custom manufactured. 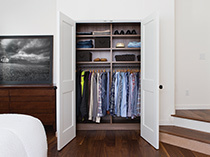 About four to six weeks after your initial consultation, your new California Closets system will be installed. If you have a specific timeline you need your project to stick to, our design consultants will be happy to work with you to meet your desired timeline. Our products range in price, depending on the type of system you need and the materials, accessories and finishes you choose. Your design consultant will work with you to stay within your budget and create a system that works for your lifestyle and your wallet. All of our products are made with high-quality materials and designed with expert craftsmanship to give you a system that will stand the test of time. 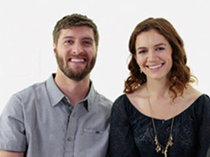 To learn about how our products are designed to fit your budget, click here. How much do your storage systems cost? Our storage systems range in price depending on a number of factors, including the size of the system and the materials, finishes and accessories used. 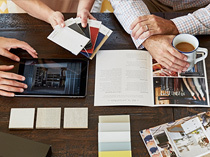 A design consultant will work with you every step of the way to ensure that your new system fits within your desired budget — no matter how large or small. Visit our Design to Your Budget page to get an idea of the various pricing tiers offered. What is included in the price of a closet? The pricing of our systems is all-inclusive. 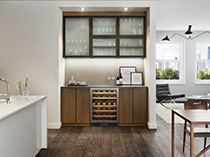 It includes the in-home or in-showroom complimentary design consultation, the system design, all materials, finishes and accessories, installation and a limited lifetime warranty. Is there space in the home that you don't work with? 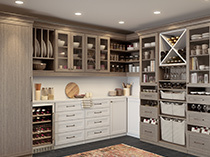 We do not work on complete kitchen and bathroom designs; however, we can work with pantry spaces and create custom storage solutions for particular areas in your kitchen or bathroom. Call the California Closets nearest you for a complimentary in-home design consultation, and we will work with you to determine how we can help make your home more organized. 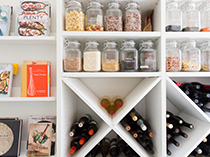 To get started, you simply need an idea of which area(s) of your home could benefit from custom storage. From there your design consultant can guide you toward ideas and solutions that fit your needs and your home’s aesthetic. How much does it cost for a design consultant to come out to my home? There is no cost for a design consultation. We offer this service free of charge to every prospective California Closets customer. When will a design consultant be available to meet with me? Your design consultant will work with your schedule to set a time that works best for you. How long will a design consultation take? Your consultation will take approximately 90 minutes. Depending on the complexity of the project, your consultation may be shorter or longer than 90 minutes. If you have a time constraint, please let us know when you schedule your appointment, and we will be happy to accommodate your needs. 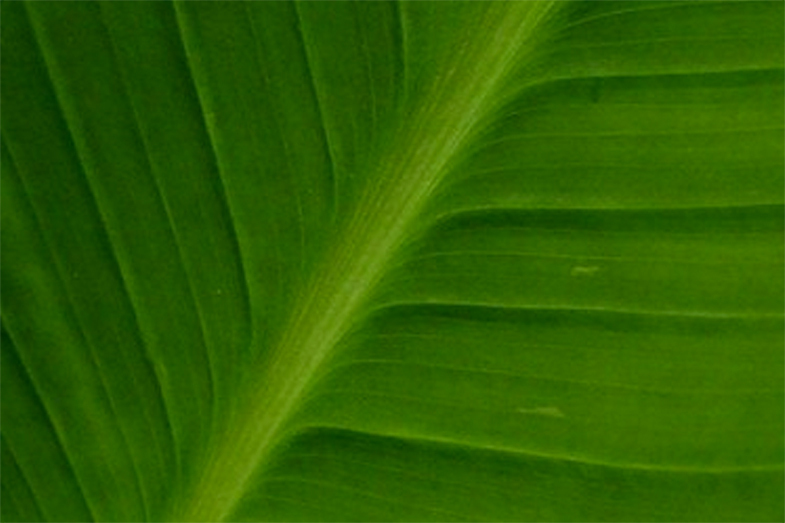 What kind of experience do your design consultants have? All of our design consultants have an eye for style and an intricate knowledge of California Closets’ products, including how to best use the products in any given situation to achieve the optimal result. On average, our design consultants have about three to four years of design experience before joining California Closets. 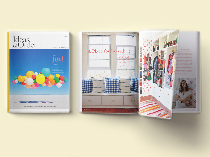 Once a designer is part of the California Closets team, he or she goes through an extensive six-week training program. One part of the training program involves our proprietary CAD software, which gives you a unique 3-D rendering of your space before it’s complete. Although our design consultants have different backgrounds, they all have one common goal at the end of the day: to ensure their clients receive refreshing and innovative spaces for their homes that will make their lives more organized and more peaceful. When will I see the design for my space? Depending on the intricacy of your design, your design consultant may be able to show you a 3-D virtual walk-through of your space at the end of your consultation, or he or she may need a few days to complete it. The design consultant will be cognizant of your timeline while rendering the design of your space and ensure that it’s completed quickly if necessary. After your 3-D rendering is complete, you’ll work with your design consultant to finalize all of the design details, such as finishes, accessories and accents. We recommend visiting the showroom with your design consultant for the final design review so that you can see all of the finishes and accessories in person when you make all of your final decisions. Are your systems re-adjustable? Can I change my design down the road if need be? Certain components of our systems, such as shelf height, specialty racks and hanging rod location are adjustable after installation. These options are popular for children’s rooms because they allow the system to change as your child grows and has new and different needs. We can also work with old California Closets designs to add new features or update the design style with decorative hardware or door and drawer accent colors. Contact your local California Closets for more details. Can I send a design I got from another company and have you quote it? Because California Closets’ products and systems are unique, we cannot base a quote on another retailer’s design. However, we are happy to work with you to create a new design based on our offerings. Our proprietary CAD software will help us design a 3-D rendering of your space based on its exact measurements. Are you locally owned or a franchise? 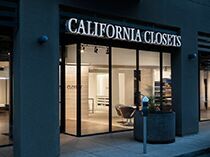 California Closets is the world’s premier custom storage franchise system with a mix of franchised and company owned locations throughout the United States, Canada, Mexico, Puerto Rico and the Dominican Republic. All these locations are independently owned and operated or have a general manager responsible for delivering an extraordinary customer experience. Is California Closets licensed, insured and bonded? Yes, each California Closets franchise complies with the requirements of the province in which it is located. Will my closet be custom made to fit my space? 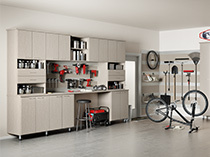 Yes, each California Closets system is individually designed and manufactured for you. It is perfectly tailored to the space it’s meant to fill, creating a seamless look with the rest of the room or area. When a design consultant measures your space, those measurements will be sent to our manufacturing facility where each piece of your system will be cut to fit precisely into your space.